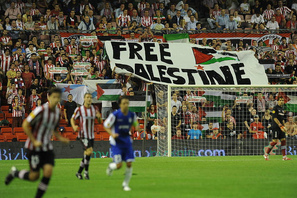 One of the demonstrations for Palestine at football fixtures around Europe this autumn. Mahmoud Sarsak, a Palestinian football player whose career was cut short by three years’ detention without trial in an Israeli jail, has issued a plea for European football’s governing body UEFA not to go ahead with plans to stage next year’s under-21 finals in Israel. Sarsak was released last July 10 after a three month hunger strike won him sympathy and support from influential voices in the football world. Former French and Manchester United star Eric Cantona, the international federation of professional footballers associations FIFPro and FIFA president Sepp Blatter were among those who called for his release. In a letter thanking those who had helped win his freedom, Sarsak said Israel was not “a normal state where citizens can play sport freely.” At least two footballers were among many hundreds of political detainees and there were endless repressive impediments to playing the game. “I call on all those who spoke out for my release and the release of the Palestinian hunger strikers, to once again show their commitment to justice and equality by insisting that UEFA move their competitions away from Israel,” Sarsak said. Film maker Ken Loach and screen writer Paul Laverty have endorsed a statement for football professionals to sign, supporting Sarsak’s appeal. Sarsak’s letter was published on his behalf by the Palestinian Boycott Divestment and Sanctions movement and has been taken up by the London-based Red Card Israeli Racism campaign. “We urge everyone who cares about justice and equality for all involved in the game of football to support Mahmoud Sarsak’s appeal,” said campaign coordinator Geffrey Lee. Red Card Israeli Racism has gathered more than 2,800 signatures for a petition calling on UEFA president Michel Platini to move the 2013 under-21 finals from Israel. Please add your name to the petition and publicise it widely. In addition you can tell UEFA – politely – on Facebook why you support Sarsak’s appeal. Campaigners staged actions in support of the campaign at football fixtures in France and Luxembourg on October 12. At a playoff qualifier between France and Norway at the Stade Oceane in Le Havre , protesters carried on to the field a banner reading “Do not play for Apartheid”. The action was widely reported in the French media. An earlier demonstration took place on September 20 at a match between Basque side Atletico Bilbao and Hapoel Ironi Kiryat Shoma from Israel. Two Bilbao supporters’ clubs took part. On July 10 of this year I was released after three years of imprisonment by the Israeli occupation forces and 92 days of hunger strike. The mobilisation by people of conscience around the world and the statements and comments by footballing organisations like FIFPro, professional footballers past and present such as Eric Cantona and Frederic Kanoute, senior football figures such as Sepp Blatter and other notable public figures, were both inspiring and immensely helpful in keeping the pressure on Israel and a major reason behind my eventual release. I would like to offer my deepest, heartfelt gratitude to all those who spoke out against the inhumane treatment of Palestinians at a time when I and other hunger striking Palestinian political prisoners needed it most. However, the arbitrary detention, abuse and torture of Palestinian political prisoners continue. Palestinian prisoner rights organisations have particular concerns about three who are on extended hunger strike – Samer Al-Barq, Hassan Safadi and Ayman Sharawna. Israel works endlessly to repress Palestinian football, just like it does many other forms of Palestinian culture. Palestinian league player Mohammed Sadi Nemer and goalkeeper Omar Khaled Omar Abu Rowis were detained in February this year and remain in prison in Israel . Football players Ayman Alkurd, Shadi Sbakhe and Wajeh Moshate, as well as over 1,400 other Palestinians in Gaza, were killed and the Rafah National Stadium was destroyed during Israel’s 2008-09 onslaught on Gaza. Israel does not behave like a normal state where citizens can play sport freely. Why then, should it be granted the honour of hosting the UEFA U21s championship in 2013, or the women’s U19s in 2015? As stated in a letter from Gaza sports clubs to UEFA president Michel Platini, we must not“reward Israel for its violent repression of Palestinian rights”. 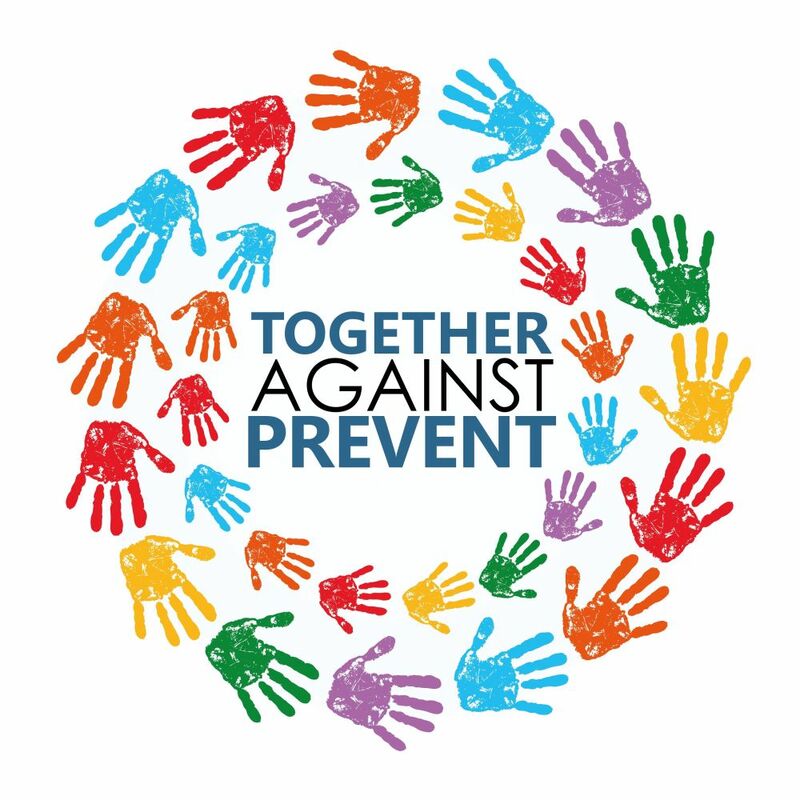 Platini has cruelly stated that the 2013 tournament will “be a beautiful celebration of football that, once again, will bring people together”. But by allowing Israel to host it, UEFA is legitimising Israel’s continued occupation, oppression and apartheid policies. There can be no place in football for segregation and oppression so prestigious tournaments cannot be allowed to take place in Israel. I call on all those who spoke out for my release and the release of the Palestinian hunger strikers, to once again show their commitment to justice and equality by insisting that UEFA move their competitions away from Israel. The cultural and sporting boycott and other forms of boycott, divestment and sanctions (BDS) were vital in the fall of the South African apartheid regime, and similar initiatives will be vital to ending Israeli apartheid. a) Omar Khaled Omar Abu Rowis turned 23 on Sept 10. He is goalkeeper for Al Amry in Ramallah, West Bank. Detained Feb 20, currently in Ofer prison. Reported to have been tortured by Israeli General Security Services, held in stress positions for prolonged periods and subjected to extreme temperatures. b) Mohammed Saedy Ibrahim Nemer, aged 22, married with one child, plays for Al Amry, on loan to Al Khader. Detained Feb 18, held in Ofer prison but moved early Sept to Remon Prison. Also reported to have been tortured. .
We often hear that there is no discrimination in Israel because Palestinian citizens can vote. Some football teams have Arab players. There has even been an Arab Supreme Court judge. This is true, but it masks an inherently discriminatory system in which most Palestinians cannot hope to be equal citizens in ‘the Jewish state’. Any Jew in the world can claim citizenship under Israel’s Law of Return and Citizenship Law, while Arabs forced to flee their homes from 1947 onwards are refused their UN-sanctioned Right of Return. The very existence of Israeli Palestinians is regarded as a threat to the state. Racist public discourse constantly bemoans the Palestinian birthrate and pushes for ‘Judaisation’ of the Galilee, the Negev, etc. The domestic secret service Shin Bet has said it will “thwart” peaceful and legal efforts to challenge the ‘Jewish’ nature of the state. There are more than 30 main laws that discriminate, directly or indirectly, against Palestinian citizens of Israel. Since 2009 the far-right government of Benjamin Netanyahu has initiated many more. It is illegal for citizens to live with a spouse who comes from the West Bank or Gaza. Backing the law, which in practice applies almost exclusively to Palestinians, Israel’s High Court said: “human rights are not a prescription for national suicide”. In 70 percent of Israeli towns, residency is controlled by admissions committees that filter out those deemed ‘unsuitable’ for the community’s ‘social fabric’. Their role is enshrined in law for 46 percent of communities inIsrael, under legislation passed in 2011. Various elements of Israel’s land regime mean that Palestinian citizens are blocked from purchasing or leasing land in around 80 percent of the country. More than 700 Jewish communities have been established in Israel since 1948. The equivalent number for Palestinian citizens is seven, all in the Negev where Bedouin communities have been uprooted from their ancestral homes. An estimated 90,000 Palestinian citizens live in dozens of ‘unrecognised villages’, many of which are in theNegev and face the prospect of total demolition. Israel strips East Jerusalem’s Palestinians of residency status for what EU Heads of Mission called “demographic” reasons. Mayor Nir Barkat openly believes in ensuring a Jewish majority in the city. Israel’s regime in the West Bank – including the 120+ illegal settlements – has been described by Human Rights Watch as a “two-tier system” where Palestinians face “systematic discrimination”. In 2011 alone, Israel demolished 620 Palestinian-owned structures in the occupied West Bank. The EU has said this is part of a policy of “forced transfer of the native population”. Amnesty International calls Israel’s control of West Bank water resources “discriminatory”, with Palestinians restricted to 20 percent of the water from the main underground aquifer. Israel blocks movement of goods and people between the occupied West Bank and Gaza Strip, as part of what is officially described as a “separation policy”. In March 2012 the UN’s Committee on the Elimination of Racial Discrimination urged Israel to end “segregation” inside the Green Line and “policies and practices of racial segregation and apartheid” in the OccupiedPalestinian Territory.